MOSCOW, April 23. /TASS/. Secretary of the Russian Security Council Nikolay Patrushev has held Russian - Pakistani consultations on security issues with Pakistani National Security Advisor Nasser Khan Janjua in Moscow, the Russian Security Council press service reported. 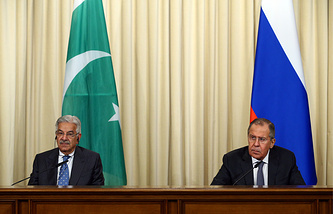 The sides stressed their interest in further security cooperation between Moscow and Islamabad. "Issues of bilateral military cooperation in information security and countering international terrorism were studied," the report says. "The general situation in South Asia and the main challenges and threats to global security were discussed." Nasser Khan Janjua arrived in Russia to take part in the ninth international meeting of security chiefs that will be held in Sochi on April 24-26.